Announcement GardenFairyDoors on Etsy, where we sell Indoor and Outdoor Fairy Doors, Gnome Homes, Hobbit Holes, Pixie Portals, Elf Doors & Secret Garden Entryways. Each door is one-of-a-kind and handmade from upcycled and found woods! 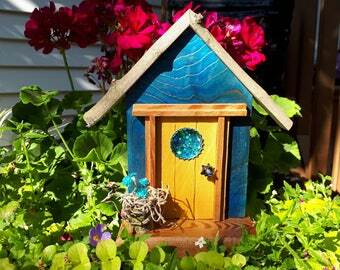 Our newest additions -- Fairy Garden Kits, Fairy Garden Garlands, Banners and "Whim" Chimes. 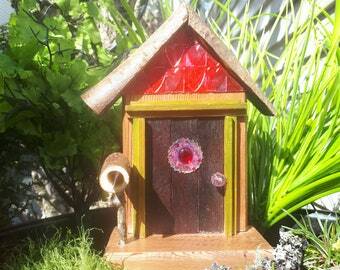 GardenFairyDoors on Etsy, where we sell Indoor and Outdoor Fairy Doors, Gnome Homes, Hobbit Holes, Pixie Portals, Elf Doors & Secret Garden Entryways. Each door is one-of-a-kind and handmade from upcycled and found woods! 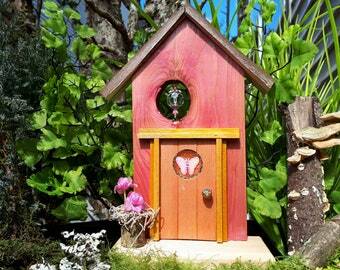 Our newest additions -- Fairy Garden Kits, Fairy Garden Garlands, Banners and "Whim" Chimes. So well made and the care in the packaging was just a testament of how much these people care about their customers. I just love this precious little door. Absolutely beautiful. Quality and care that goes into each piece is fantastic. Another fantastic purchase. Beautifully made. So magical in ever sense. I can't wait to gift it to my granddaughter. 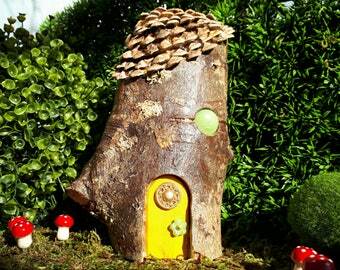 Such a sweet fairy door! Exactly as described and pictured. The seller was so kind and it arrived lovingly packed and cared for. Beautiful door, can't wait for summer to decorate. Beams and Branches and Rounds... Oh MY! Lots of different woods, finishes & techniques to fit the Fairy Door needs! Slabs of woody goodness, branching out in the GardenFairyDoors workshop. It's a hot fairy real estate market! Hi, I’m Bob, the wacky woodworker. My wife, Lorie, is in charge of the fairy frills and aDOORnments department. 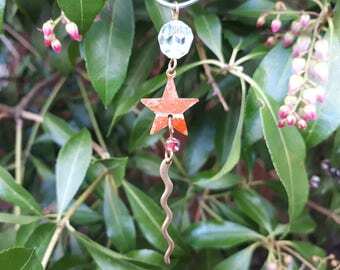 Together we conjure up one-of -a-kind whimsical – and sometimes magical – doors for fairies, gnomes, hobbits and pixies to travel between our world and theirs. Although we cannot guarantee that such creatures will inhabit your garden – you’ll never know until you invite them! We think our doors are an enchanting enticement and an aDOORable decorative addition to any garden. In real life, we run HauteNote.com - an online personalized stationery and custom note company. And in our play life, well, we’re into all sorts of crafty things. We both dabble a bit in making lampwork beads, which have become our charming and wonky fairy doorknobs. You’ll find beads and sequins and all kinds of found treasures and objects incorporated into our door designs. We love scrounging around flea markets, garage sales, vintage stores, thrift stores and antique malls, looking for the perfect odd-ball items! 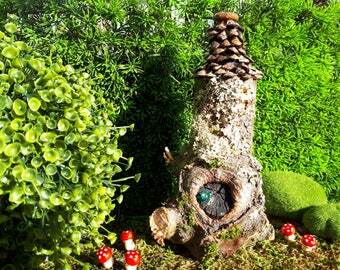 How our fun with fairies all started is quite a sweet tale. 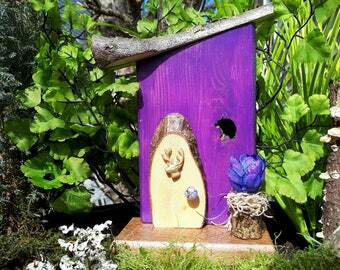 If you are interested in finding out more about how we got started in the Fairy Door Fabrication Biz, visit our website: http://GardenFairies.ca. 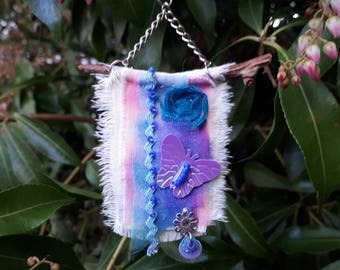 Check out the “How it all Started” page and the Fairy Project Blog for ideas to share with the fairy-fans in your life. I'm the Embellisher. I add the fairy flair to these aDOORable creations. When not flinging fairy dust about, my grown-up job is Haute Note, an online personalized stationery company. We have 2 cats, Barnum & Noah, our purrrsonal assistants. I'm Noah. I don't actually do much or accomplish anything, but I'm cute. My brother and I have howling competitions in the middle of the night. I am most definitely the loudest! I'm Barnum. I also don't contribute much, but I climb into empty boxes, and sit on top of piles of paperwork. In the middle of the night, while practicing my howling, I like to run up and down the stairs as fast as I can! Welcome to GardenFairyDoors! Thank you for visiting! From time to time, gremlins get loose and wreak some mayhem and havoc (as gremlins are wont to do). If your item has been affected by a gremlin, or one of his evil minions, please contact us immediately. We want you to be satisfied with anything you purchase – after all, we want you to continue shopping with us and it makes sense to treat you honestly and “fairyly” at all times. If you receive your order and do not like or want to keep your door, we will certainly take it back, but we cannot cover the return shipping cost or refund the original shipping cost. In the rare event that the door you receive is damaged in shipping, please let us know and we will arrange a replacement or refund. If your door arrives damaged, to expedite your claim, please send a photo of the door, and the packaging, and we will do our very best to make it right. Our doors are already finished and are ready to ship within two business days. In Canada, we ship using Canada Post’s Expedited Parcel Service, which comes with a tracking number. Orders shipped to the United States, are shipped using Canada Post’s Small Packet service, which does not come with a tracking number. If you wish to have tracking on a delivery to the United States, please advise us BEFORE purchasing and we will let you know a shipping rate for a "tracked" package to your location. Please make sure your PayPal address matches your Etsy address. If these are not the same, we will ship to your Etsy address unless you advise us ahead of time with other instructions. Please ensure your shipping information is up to date and the address is correct to avoid any delays or additional shipping fees. We cannot offer refunds or replacements for orders shipped to the wrong address. To our American customers: Although we ship promptly (1-2 business days) once it leaves our hands, we unfortunately have no control over any delays caused by Customs inspections at the border, or how this affects the subsequent USPS delivery schedule. If you have something different in mind, than what you see in our shop, we would be happy to discuss with you whether we are able to help you with a special request. Each door is one-of-a-kind and no two colour schemes are the same. We take a photo of each door separately and post it to our Etsy shop. Because every computer screen displays colours differently, it is possible the door colour may seem to vary from the photo on the site. If you are unhappy with the colour you may return it for a refund but you would be responsible for the return postage. We also try to make sure the colour is explained as best as we can in the description of the item. Although your door is designed to be displayed outdoors, nature's weathering process may fade the colors over time. Frost and freezing temperatures can also cause damage to your door. This is why we recommend bringing it inside during colder months.